And I almost forgot to mention: We had the pleasure of having a Moose Burger at the WPS, meeting up with Laura and DUG. Went down to talk with DUG and meet his scout crew. I hope they had a good time hunting the Rabid Grouse on the Meysan Lakes trail. DUG, it was good to finally meet you face-to-face! It is 10 MB (large), so downloading may take a little time. Thanks Jeff. That is a good video, and good picture, too. I hope we can capture some nice ones like that. I'm not going to even ask you you did this (technologically). Kinda like HikealongPete's sped-up Mt. Whitney Trail videos with even more afterburners turned on! Today's (6/21) 5:53 am snap gets my vote for best sunrise. How about a video made of frames from about the same time, running over months to show the snow melt? I like more shadows, as in these below. I'll try to re-instate one of them for the overnight view this evening (and it will be full-size). By the way, if you view this tomorrow, or a later date, these pictures will be different. Be aware that we are using more compute power than the Apollo LEM/CM to bring you these images - & that from a discarded computer. I just cannot get enough of these sunrise pictures of Whitney! The one and only time I was there was a group trip, so when it was through, I gathered up EVERYone's professional-quality whitney shots, because they just put you in a good mood! (thanx again, Axeman -- I still love your shots! )The other morning, I had to get up really early, and it was NOT for a hike, however, the webcam shot allowed a quick commune with the mountain. So, when are you going again? It's not like you're on the other side of the country (that would be me and catpappy)! Catpappy! I actually met him once. But this Grande Dame is 8hrs away! Peak #3 however, requires at least 4 days off and a whole lot more driving + I have to drive through The Land of Glory (Yosemite) to get there -- with 3 more hours to go after stopping at The Land of Plenty (Whoaa Nelli Deli)Because I hate HATE to drive by myself (I fall asleep at the wheel pretty easily) I usually have to time my trips around when others are making pilgrimage. When will I return? I have been enticed by three-day backpacking trip to Mallory/Irvine at the end of July...we shall see. 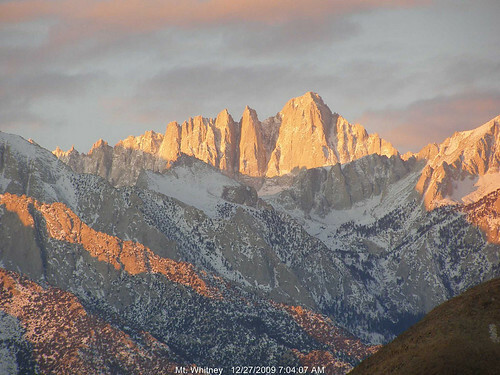 Here's a video on YouTube from the Mt Whitney webcam at the Lone Pine Film History Museum, from yesterday. do you have the vid from 9/8/10. I'd like to see if it looked as ominous from down below as it did from the summit. No, sorry. The web cam computer deletes and replaces the video it has every 24 hours. And if I don't log on and copy or upload it before the end of the next day, it is gone. 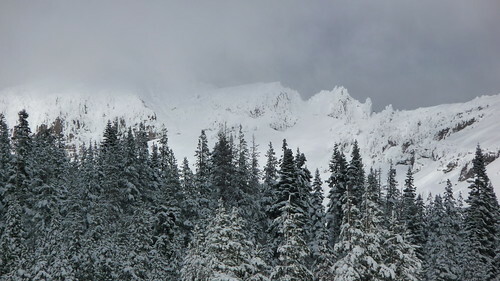 But usually on those stormy days, Mt W is completely obliterated by the clouds. I'll try to be more vigilant and grab the video next time stormy weather pulls through. I hope everyone enjoys the night-time web cam views that we have. Those are ones I see and grab every so often, and place in a location for the web cam computer to upload at the end of a day. Wagga alerted me to this morning's Whitney picture. So it is the night view until another good one comes along. I grabbed the one from 8/29 7:23pm when I saw it up there. That was the most beautiful photo I have seen of Whitney. I saw that you posted it as the night photo several nights in a row. the new camera angle is GREAT! gives a much more majestic view and also gives a more practical view of the surrounding weather. My desktop background on one laptop is from 8:27am today and on my other laptop it is from 3 minutes ago at 12:30pm today. Wow talk about dynamic weather.Like they say if you don't like the weather in the Eastern Sierras wait an hour. Generated in 0.182 seconds in which 0.171 seconds were spent on a total of 14 queries. Zlib compression disabled.